This year, I decided to be more adventurous. This new adventurous me would do the things that I’ve put off doing for years, like learning how to cook. Update, I still don’t belong in the kitchen on Thanksgiving, but next year is looking optimistic. This also welcomed challenges. As a kid, I don’t know if I was afraid of the water or it was a lack of exposure to it but I didn’t know how to swim. Let me just tell you that as clique as it be, anything is possible with dedication. After two years of lessons, I can finally swim. In fact, I am currently learning the last stroke, “Butterfly Stroke”. Turning this new leaf of life also meant trying things I have no interest in (more on that in upcoming posts). But most importantly, it meant trying things that I thought would be fun. Starting a blog was the first thing that came to mind. Reason being is I love expressing myself. I still keep a diary to log my inner thoughts, achievements, setbacks, lessons learned, etc. Although I love writing in my diary, I think it’s time to start sharing some of my experiences because I feel we could all learn from each other and what better way to share them. I can’t promise you that my blog will be your cup of coffee (see what I did there), but I feel there will be something here for everyone. Hope to see you on this voyage. 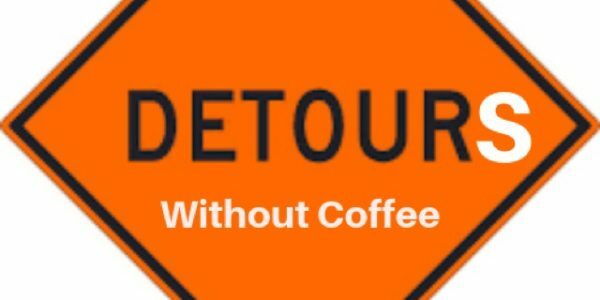 Welcome to “Detours without Coffee”. Next Post When was the last time, you did something for the first time? This is amazing, I can’t wait to read more! Thank you and I appreciate you so much! Good for you! Welcome to the blogosphere! Haha this is so cute. Again, I can relate because I don’t know how to swim. But I’m a lot older than you and the fear and embarrassment of starting have very deep set roots. But I’m proud of you for sticking to it and getting it done. Good luck with the cooking thing. I can relate. Most of my life there have been things I wanted to do but didn’t or couldn’t because I was so busy taking care of others (like my family) but mostly it was because I was afraid. Afraid of failure. I have always loved to write. Always dreamed of writing as my career. So this is my first step. It’s a small step and I have no idea what I’m doing but but it’s a step. I’m at least attempting finally to try and make my dreams come true. I have to be proud of myself for that. I hope this is the beginning of many more firsts for me! I’m so glad to meet you. I can’t wait to see more from you! Thank you for Sharing! I’m proud of you for taking the first step despite your fear. I always remember this quote by actress Sherry Shepard, “whatever scares you, run towards it because that’s where your freedom is.” Thank you for following my journey and I look forward to following yours too.